OK so, unlike when I got into writing about the Keep Calm posters, where there was a finite amount of research to reference, transit maps are a total rabbit hole. If you are interested in the subject, there’s hours, days of resources only a google click away, map-dedicated blogs, and a few books as well. I’ve included some of the most useful resources I found under each image. 1933 Tube Map for London Underground by Harry Beck. Click for gigantic version. 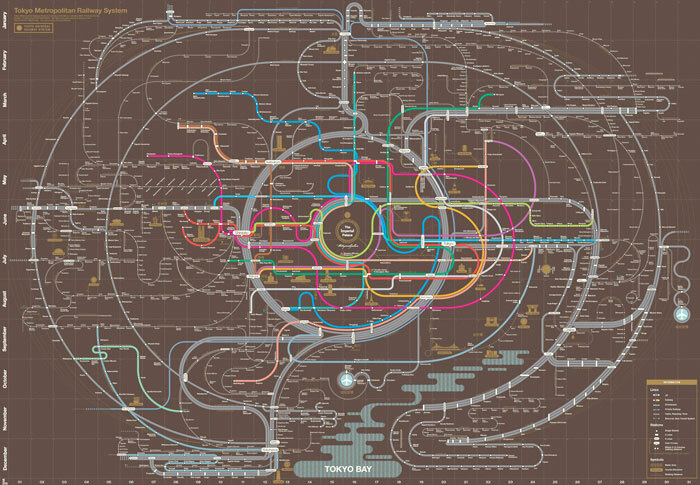 Beck introduced the vocabulary of rounded angular abstraction to transit maps, having arrived at it in part from his background as an electrical draughtsman. 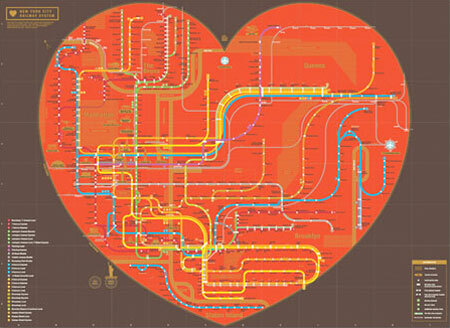 Though it can’t be reduced to this: his inspired design was the basis for mapping transit systems for decades and remains probably the most influential transit map ever. 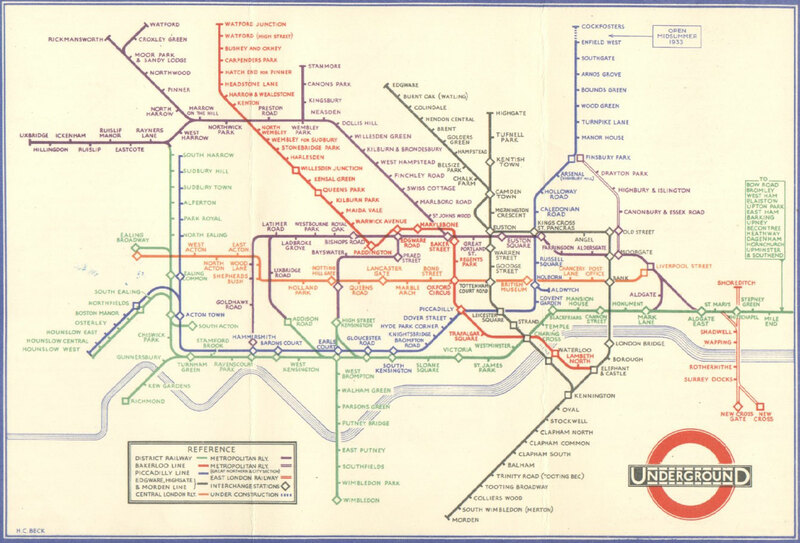 The history of all the tube maps, before and after Beck’s, with images and commentary, can be read here. 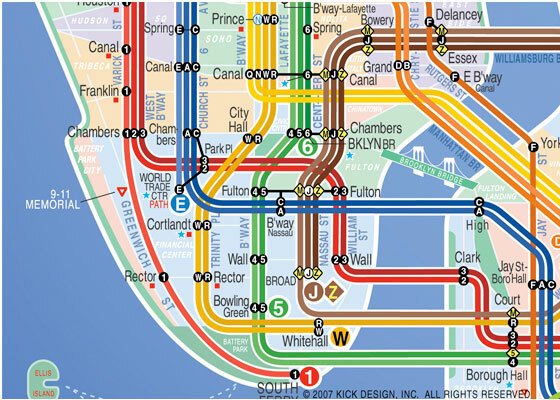 1972 New York subway map by Massimo Vignelli. Click for gigantic version. The essential map of a modernist’s canon (and yet contrary to modernist ideals, more beautiful than utile). Michael Beirut at Design Observer writes about Vignelli’s map (with characteristically enlightening comments thread including, among others, Vignelli, Spiekermann and of course DesignMaven). 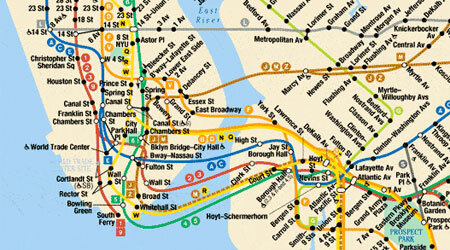 Gothamist Interview with Hertz on his design, including discussion of Vignelli and Jarbour’s design. He makes some solid points about the inability of any map to solve all problems, and makes a pretty strong case for his geographic/abstract hybrid. 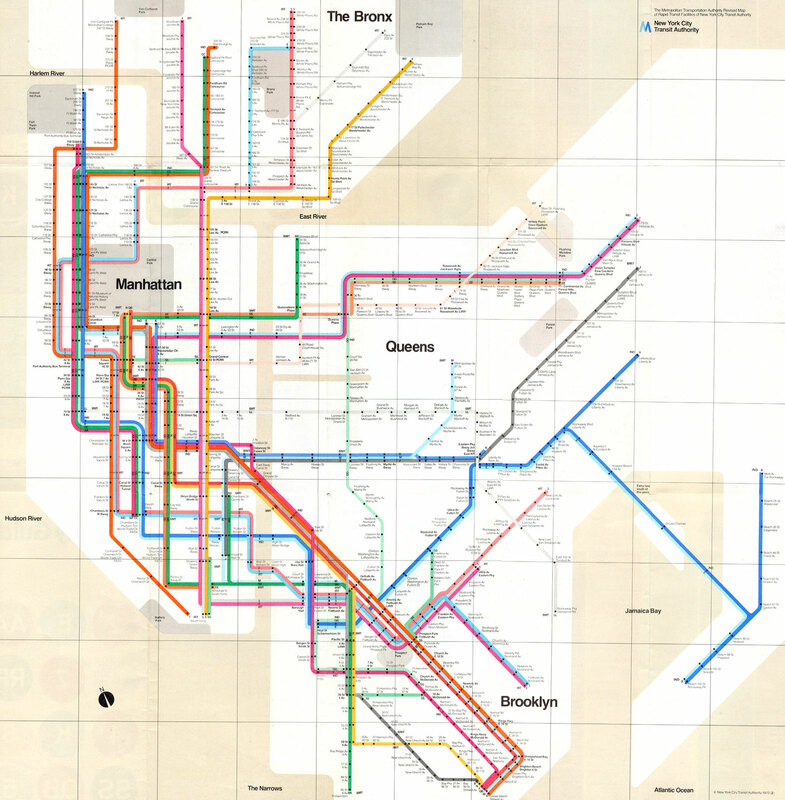 Mr. Jabbour made a subway map design that was somewhere between the pure modern abstraction of the Vignelli and the geo-accuracy of the current Hertz map, with additional awesomeness like clearly delineating separate routes on a line, free transfers and neighborhoods and boroughs. I actually think it’s a fantastic map. He pitched it to the MTA and they turned him down, but he continues to tinker with it and advocate for its use, and there’s now, ahem, an app for that.Â There are a lot of articles and interviews to read about Jabbour’s map â€” Gothamist, New York Times â€” but I recommend both his own writeup (which includes a great comparison between his, Vignelli’s and Hertz’ maps) and this 37signals article about abstraction vs. geographic accuracy using this map and Beck’s map as examples. I’m glad that I found this article or I may have wasted my time inadvertently plaigarizing it. 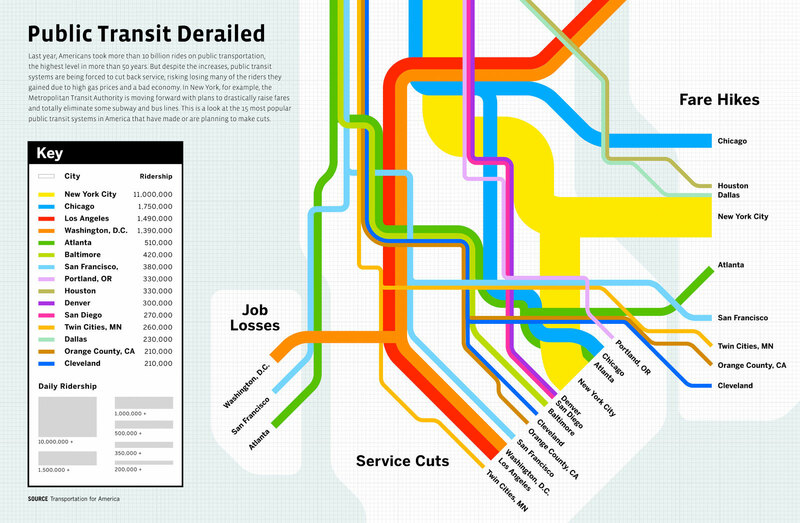 Cuts to Public Transit, 2009. GOOD Magazine and Kiss Me Iâ€™m Polish. Click for gigantic version. Disheartening but informative infographic. Not a geographical map, but a damn good use of the visual language of them. I ride MUNI, BART and Caltrain every day, and all three (and the state of California itself) are in absolute crisis, budgetwise: honestly I feel like, let GM crumble into nothing and save public transit, Obama! But I guess it’s more complicated than that. Thought you might like to know Zero Per Zero also now do a London maps range which looks very cool. Do check out the tape its their coolest product as far as I’m concerned! Ooh, the tape is really cool.